Made from aluminium and extremely durable. Completely weatherproof and ideal for outdoor use. Easy to install on posts. 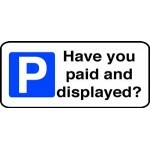 Have you Paid & Displayed car park sign. 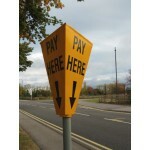 Reminder to Pay and Display. Made from aluminium and extremely durable.